Fish for the holidays? Sure, why not. Not everyone eats beef or pork, and even those that do might welcome a dish that doesn't make them feel like they need a nap afterwards. Fish is "lighter," but it doesn't have to be light on flavor. Mustard is the key ingredient in this dish, which also benefits from Asian flavors: white miso, sesame oil and soy sauce. Broiled salmon is super easy and fast to make. So not only will this please your family, but it won't take up all your time to whip up. I served this with honey-braised collard greens. It would also be good with roasted Brussels sprouts and perhaps mashed potatoes with a little wasabi kick. 1. Heat olive oil in a large sauté pan over medium-high heat. Add garlic and chili pepper flakes and sauté until fragrant, stirring constantly, about 1 minute. Add the collard greens and stir to coat with oil and garlic. Coat until wilted, about 5 minutes. Add chicken broth and honey and stir to combine. Cover, reduce heat to medium-low and cook until the greens are tender, about 10-15 minutes (thicker greens require longer cooking time). 2. Remove lid and continue cooking if there is much moisture remaining (pan should not be completely dry though). Drop miso into pan and squeeze the lime over it. Stir to break up the miso so it combines with the remaining juices in the pan. 1. Preheat oven broiler with rack in top position (about 5 inches from broiler). 2. Line a baking sheet with aluminum foil and spray with olive oil. Place the salmon fillet on the baking sheet, skin-side down. 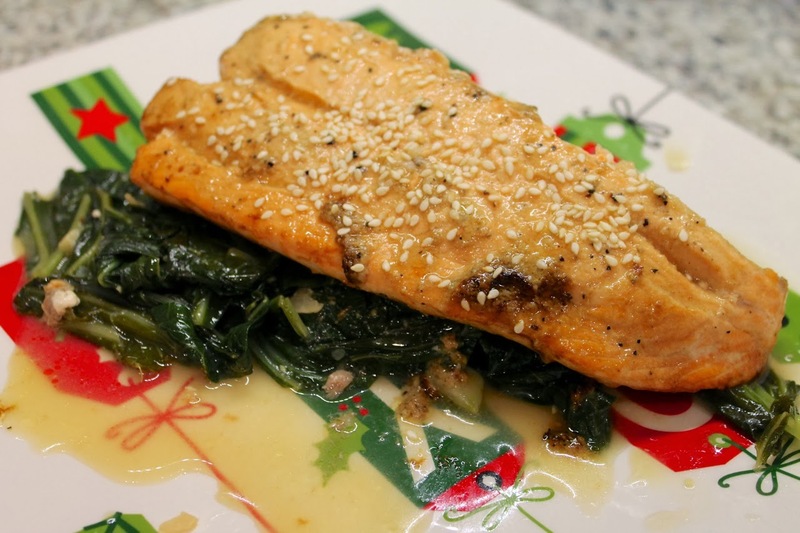 Combine the olive oil, mustard, soy sauce, pepper and garlic in a bowl and pour over the salmon. Broil salmon for 5 minutes. Turn fillet over and broil another 5 minutes. Remove skin and check for doneness (broil additional couple minutes if desired). Divide the collard greens between two plates. Place a salmon fillet on each pile. Squeeze the lime over the salmon and sprinkle with sesame seeds. This was really delicious, but don't you dare try to serve me salmon on Christmas. Don't you worry. No feast of the seven fishes for you.